One of the Top 10 Native Plants for Pollinators in The Big Little Garden, Veronicastrum 'Fascination' lends height, structure, texture and very long-lasting bloom. It boasts gorgeous, whorled lanceolate foliage, a central 'candelabra' inflorescence of light purple spikes, and is surrounded by later blooming lateral spikes that emerge from the leaf axils. Most importantly, it's an absolute bee and butterfly magnet! If your garden is begging for tall, spiky blooms with non-stop pollinator action, then this plant is for you! The following photos depict the heavy flower production and bloom progression in my own gardens as well as in a client's garden. Mid-June foliage soon produces glorious blooms that persist until early August when dried flower spikes continue to provide verticality and architectural interest. When grown in full sun, may need to be cut back in late summer or early fall. Plants grown in part shade may require more staking, but foliage will remain green longer. Veronicastrum was relocated from a different area in this sunny afternoon bed where it was being over-run by the tall giants: Joe Pye Weed and Filipendula. It's now located under the Korean Lilac tree and toward the front of the bed to show off its beautiful, whorled foliage. Now in bloom, Veronicastrum's "see-through" habit allows it to be planted in front of shorter plants, like these Shasta Daisies, without obscuring the view. This dramatic perennial is a design giant in the garden. Unlike some other tall plants, it is very well-behaved and plays well with others. By August 10th, most of Veroncastrum's lavender bloom has passed, but the dried flowers and whorled foliage are still attractive and deserving of a place in the garden. Seen here beautifully backlit by the morning sun. I am a fan of leaving spent blooms on many plants for ongoing architectural interest, including the Filipendula 'Queen of the Prairie' (back left). Veronicastrum's loose, airy growth habit lightens up the mass of Shasta Daisies. In this garden bed, it's slightly elevated above a low stone wall, making it appear even more dramatic from eye-level. This photo shows why it's one of the most admired plants by visitors to the garden. On July 4th, Veronicastrum dominated the Mailbox bed. Now, on the 16th, orange Tithonia (Mexican Torch Flower grown from seed) is gradually taking over and will engulf the Veronicastrum by the time it's dormant. By late August, it will be cut down and Verbena Bonariensis will emerge to take its place. Veronicastrum may benefit from a couple indiscreet plant props after heavy rain as seen above. Veronicastrum is a knock-out when planted with even taller summer-blooming perennials: Filipendula, 'Queen of the Prairie' and Thalictrum Rochebrunianum (Meadow Rue). Just be sure to give them all plenty of room to stretch out. This one year old installation garnered much attention during our recent Symphony NH Garden Tour. Client project here. The photo gallery above shows just a few examples of pollinators that give Veronicastrum 'Fascination' a huge thumbs-up! It was by far the most favored plant for bumblebees. Now that it's done blooming, the bees have moved on to favor Agastache and Monarda. This fantastic perennial is not likely to be found at your run-of-the-mill nursery or big box store. I source the best specimens at select New Hampshire wholesale growers. 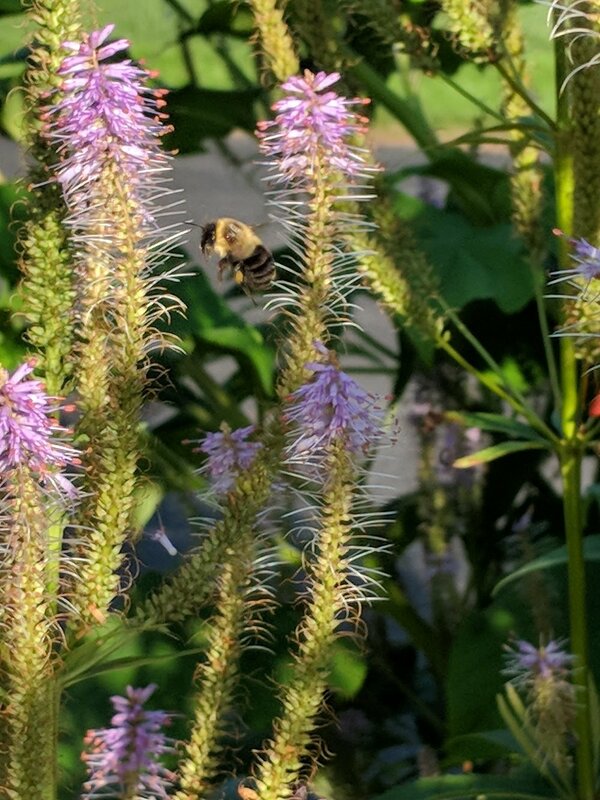 If you are interested in learning more about Veronicastrum and would like to include it or other hard-to-find perennials in your garden, just click the button below!